Not needed to bring it into action yet but I was very impressed with the safe packaging it was delivered in. 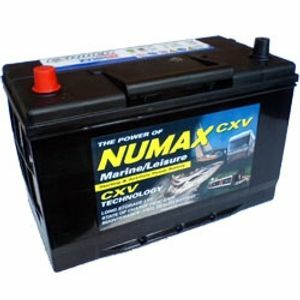 Numax CXV30HMF Excellent battery,replaces previous same model from same supplier. Paid for next day delivery, courier sent me text as to delivery time. Very good value for money - prompt delivery. Great battery delivered on time. very well priced, very fast delivery and very safely packed. Battery arrived next day. Extremely well packaged. Good price. This is my second purchase from tayna. Previously bought 3 batteries for my narrowboat. You will be my first stop to shop for any future batteries. Good product my last numax lasted 7 years and it was still going strong when I got rid. Shopped around and this was a excellent price, delivery very quick with excellent updates even meaning I knew within the hour the delivery time. Item delivered well packed and having fitted it seems ok. Only one suggestion perhaps fitting instructions could be included. A good battery with a very fast delivery. Exception Staff very helpful! We fitted this to our Hyster forklift turns it over with power to spare. Product seems fine, although the terminals were a different pattern to the Original Equipment Ivor Williams battery this was easily resolved. The delivery service by UK Mail was easily the worst I have experienced for years. I was promised a delivery on a Monday PM, but received an e-mail to say the driver was delayed. The delivery was then rescheduled for Tuesday PM, again received an e-mail to say it was delayed. Rescheduled again for late Wednesday PM but arrived mid morning. I accept that problems can occur with delivery schedules, however, it is unusual to say the least for this to happen twice and also receive wrong information re the successful delivery time. Perhaps Tayna should review the performance of it's carrier. Good product, does what it says, came very well packed and on time. Couldn't ask for more. Martin Robe.